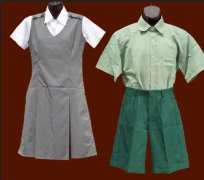 The Standards Organisation of Nigeria, has warned importers of school uniform materials into Nigeria about some cancer-causing substances found in some school uniform materials made by two China based companies. Aboloma added that all International Accredited Firms undertaking the off-shore Conformity Assessment Programme on behalf of SON all over the world have been put on alert regarding the cancer-causing substance in school uniform materials and other clothing materials to be imported into Nigeria. The News Agency of Nigeria , reports that SON is the body in charge of standardisation of all products in Nigeria.